'Drunk Nate Silver' Parody Wakes Up After Real Nate Silver's Big Score : The Two-Way "Just saw @karlrove in a bar. Aaawwkward," tweets the fake homage to the blogger who nailed the Obama-Romney race tweets. Being hailed as Election Night's second biggest winner continues to bring attention to the FiveThirtyEight.com guru. Being declared the election's second-biggest winner has meant lots of attention for FiveThirtyEight.com statistical wiz Nate Silver, who pretty much nailed the Obama-Romney race. It's also put new life into the Twitter parody account "Drunk Nate Silver." "Just saw @karlrove in a bar. Aaawwkward." A few minutes ago, @drunknatesilver said "I definitely woke up within the margin of error." 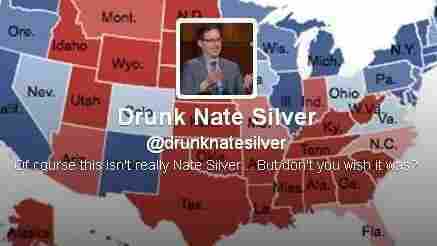 Also, #drunknatesilver tweets are becoming something of a trend. Our own 13.7 blogger Adam Frank just tweeted that "#drunknatesilver doesn't go back to the future. The future comes back to him." If you want to see the real Nate Silver offering his analysis on Election Night, click here. By the way, our dear friend Korva, the well-read member of The Two-Way team, wants us to be sure to note that Silver's also being compared to Hari Seldon.